The world’s forests face unprecedented threats from invasive insects and pathogens that can cause large irreversible damage to the environment. This threatens Canada’s capacity to provide long-term wood resources and ecosystem services that range from carbon storage, nutrient cycling, water and air purification, soil preservation and maintenance of wildlife habitat. The number of new introductions and interceptions of Forest Invasive Alien Species (FIAS) is escalating at an alarming rate, with 37% of all invasive species introductions reported between 1970-2014, including a maximum of 585 new records in 1996 (Seebens et al, 2017). The key to reducing this risk is via vigilant biosurveillance to increase preparedness and facilitate early interventions. The bioSAFE project comes at a time when global trade is occurring at an accelerated pace and from all parts of the world. To match this pace and prevent introductions or invasions of pests and pathogens, our biosurveillance methods cannot rely on current tools alone. Our current tool set enables us to identify target pests and pathogens; however, it provides little means of determining their source. The ability to determine source would allow regulating agencies to identify locations of higher risk, thus allowing a strategic means of allocating resources to certain shipments with greater potential of risk. We have a team of renowned scientists with vast amounts of experience in both academia and government. We also have access to facilities that include certified pest containment leveled laboratories and technologically advanced equipment to conduct various experiments. This team is ready to tackle this challenge by conducting research studying the genomics of these organisms and developing advanced source identification tools to supply both the forestry and agriculture sector, assisting with surveillance and pest management planning for various levels of government and stakeholders. 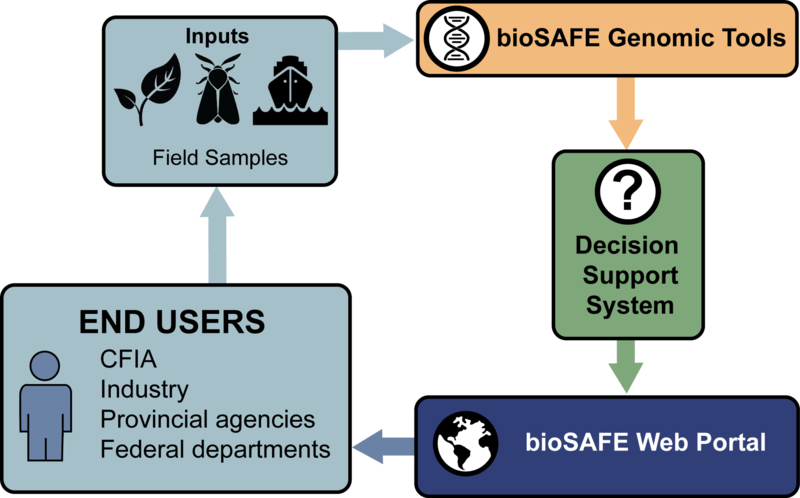 To develop biosurveillance tools that identify both species and source populations of pests and pathogens, and ensure that these tools are accessible to the forest protection community and other communities that may be affected. The BioSAFE project team will collect global populations of the Asian Longhorned Beetle, Asian Gypsy Moth, Dutch Elm Disease and Sudden Oak Death. We will sequence the genome of all 4 species and analyze their population differences and similarities. We will also conduct experiments for the four species to study their functional abilities to invade North America, spread and survive. We will study cold tolerance, flight capability, virulence and multiple host attack abilities respectively for Asian Longhorned Beetle, Asian Gypsy Moth, Dutch Elm Disease and Sudden Oak Death. By studying these traits and combining this information with their population differences and similarities, we will identify markers that will be used to develop the biosurveillance tools. No other project will have such an extensive global collection of these four species. We have experts on our team as well as collaborators in both academia and in regulatory organizations in North America as well as internationally providing their collections or gathering specimens for this project. The wealth of information we will gather will enable the development of comprehensive biosurveillance tools for each of the named species. The BioSAFE tools will be tested extensively with a variety of samples and conditions (temperature, sample quality, reproducibility to name a few). By assessing the biosurveillance tools, we will be testing the approach taken in the development of the tools which will enable the transfer of this approach to other pest and pathogens. The transferability of the tool development approach and the tools themselves is unique to this project as previous projects have been too specific preventing their tools to be used on other organisms. What are the outputs of this project? There are three critical outputs of the project. The main output is the development of the Biosurveillance tools for species identification, geographic origin and spread abilities of Asian gypsy moth, Dutch elm disease, Asian longhorned beetle and sudden oak death. The other outputs are the Decision Support System and the Database. What are the tools and how will they be used? The biosurveillance tools are DNA detection probes that will be used to identify species and determine unique signatures that match specific traits related to the pest or pathogen’s origin. We will engage with regulatory agencies and either transfer the protocols developed in this project or provide them the service of testing their samples for them. Seebens, H., Blackburn, T. M., Dyer, E. E., Genovesi, P., Hulme, P. E., Jeschke, J. M., ... & Bacher, S. (2017). No saturation in the accumulation of alien species worldwide. Nature communications, 8, 14435.